We've just added search to jAlbum! Now you can type your way to the right setting while using jAlbum instead of browsing though complex user interface panels in your hunt for that font size of color setting. What would internet be without Google? We'd have to remember a ton of pages and navigation paths for resources we revisit regularly and rely on clever hierarchical directories for finding new information (Remember those sites from the old days?). These days we simply "Google" everything, even if we know the page's URL, cause typing a few words is usually faster. We even search our local computers instead of manually navigating folder trees, still when using advanced software we tend to have to navigate the user interface in a hierarchical fashion. jAlbum has tons of features today. It's inevitable that the user interface becomes increasingly complex as features are added over the years. We try to structure the settings intuitively, but some features inevitably need to be buried 3-4 levels down. jAlbum's Settings window now has a new search box in the top-right corner. Hit TAB to activate it, then type a few keys to see a list of matching items in the menu below. Use arrow keys + ENTER or the mouse to select the setting you wish to access. jAlbum will now immediately navigate to that setting and highlight it with an animated ring. If you got the wrong setting, simply select the search box and hit arrow down to reveal the last set of search results again or type another search term. You can narrow the search by typing multiple words. What are you waiting for? Download jAlbum 18.2 today! 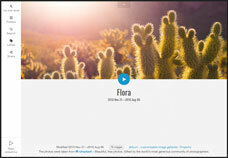 Photoblogger was my first attempt in creating a database-driven skin. By using a database, albums receive a super power: global search, tag filtering and new image collection, so visitors can easily find the images they´re after. In the meantime a few new skins came with database support too – e.g. 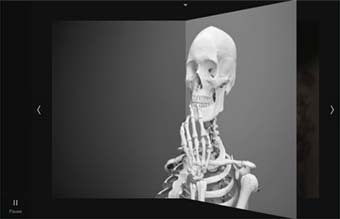 Tiger and Projector – with better coding and more features. Now the time has come to give some love to Photoblogger too. Flex layout is what web designers were always phantasized about. This makes it possible to align items within a container box (and relative to each other) horizontally or vertically whatever you like. Did you know previously there was no proper way of aligning an image vertically and horizontally centered within a box? Crazy, isn´t it? The new flex layout even makes it possible achieving the so-called “masonry layout” (horizontal tiles) without a line of code. Feels like we´ve skipped to the 21st century. Today more than 99% of users has flex-capable browsers, and although Internet Explorer 11´s implementation is buggy, MS Edge works well. The user interface has been totally redesigned. I know those who has accustomed to the old organization might feel lost finding a particular setting in the new one. The new layout tries to sort the settings according to where they appear on the page: Header, Sections, Side bar, Footer, Lightbox. I hope existing users will easily accustomed to this, and Tiger or Projector users will find it already familiar. 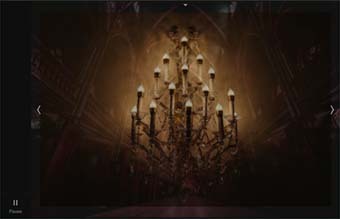 Instead of the plain header now you´ll be able to use a background image too. 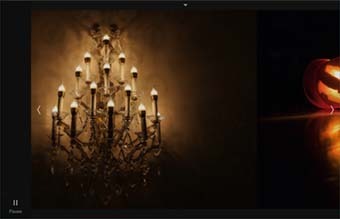 If your album doesn´t have an appropriate, toned-down image, you can download one from Unsplash – e.g. here or here – for free. Once you chose a bakground image instead of the plain color, why not give a try to the new, centered folder title? Naturally, the old – left aligned – title still exists, moreover you can align it vertically too. Want to see more images from a folder? Now you can. The “endhanced” folder thumbs gets 3 more images – chosen randomly – next to the folder thumbnail you picked. And now you can have all the folders made “enhanced” if you wish. A popular feature inherited from Tiger, pimped up. 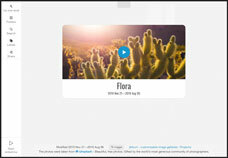 With this tool you can ask feedback through email from users. In this skin users can choose if they want to open the email app directly or just copy the email content to the clipboard for later use in a web mail. This feature is also good for putting up a simple kiosk. Folders come first, the custom pages maybe the map? You decide. You can reorder the boxes in the side bar too. Previously the side bar always meant a side bar on the right. In this version you can place it to the left too. Quite a few users asked if they can move the top navigation to the top bar – sharing space with the social buttons and search. Now you can. Not only to the top bar, but to any corner of the header. Some old styles has been removed, like Fresh, Military, Material, Sage, Turqoise, while 3 new styles added: BlackAndWhite, Eggshell and Simple. I tried to make more of the simple layouts – users prefer. If you still prefer one of those deprecated styles, just download the 1.x version, rename to ZIP, and copy the appropriate files from the styles folder into the same folder of the new skin (press Ctrl-Shift-S in jAlbum). Please note, this is such a fundamental change in Photoblogger skin, it should have named v10.0 or something. Some of the old features got removed, and many more has been added. (E.g. the fancy caption animations on thumbnails got retired.) Before you install the skin I suggest to save the settings with the "Save project settings as..." command. Give it a name you remember, e.g. jalbum-settings-1.jap and reopen jalbum-settings.jap to be updated. 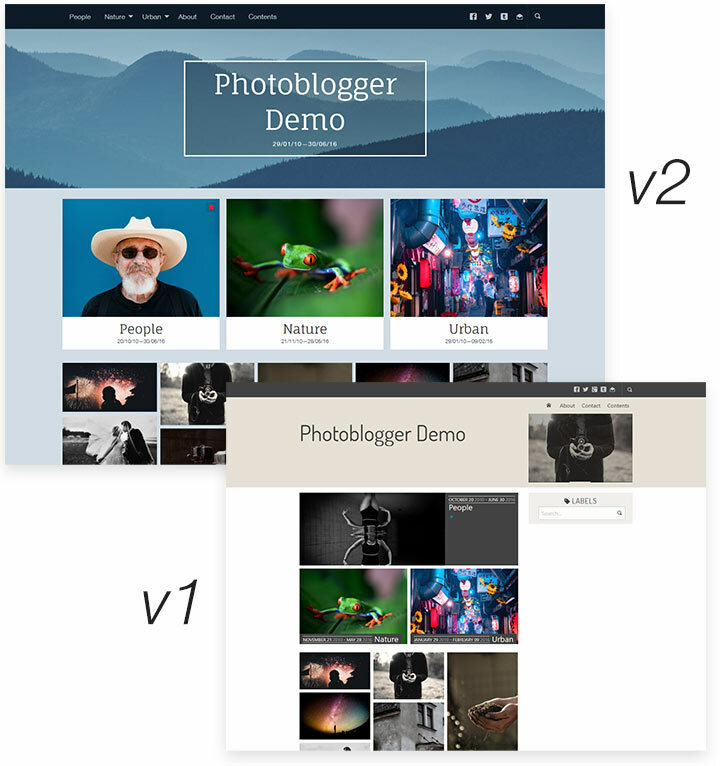 If you want to go back to the previous version, download Photoblogger 1.9.7 from here, (double-click) and let jAlbum install the skin. Now open the saved jalbum-settings-1.jap which holds the old version settings. As the programming language has changed in the skin the custom pages might carry improper code, which will stop the Make process. If you stumble upon this (in About.htt, Contact.htt or Contents.htt) download the “Update project templates” tool from here, (double-click) and allow jAlbum to install it. Now you can use: Tools → External tools → Update project templates. This will update all the project templates to match the new version. Sorry for this inconvenience! The new version was made to survive skin changes – at least within the same skin family –, so hopefully you will never have to do this again. jAlbum 18 has just been released. The main improvements in this version is a faster album uploader and the new Project Gallery - the subject for this blog post. With active regular use of jAlbum over some time you end up with a huge amount of album projects. Finding the right one isn't always easy. The "Recent project" list helps, but the thumbnail images are rather small. Enter the new Project Gallery! 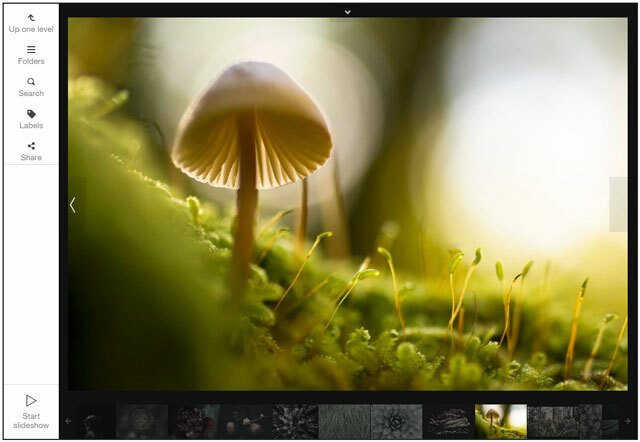 This window presents large thumbnail images of web previews of each album project. If no album has been made (i.e. no web files present), then the gallery resorts to displaying a large version of the representing thumbnail instead. To access the Project Gallery either press CTRL/CMD+G, select File->Project Gallery or hit the new project gallery button located just to the right of the new project button. You can even double click the "Recent projects" label (project ordering label) to open the Project Gallery. 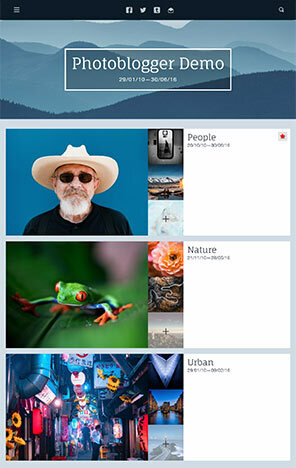 The Project Gallery presents a grid of large thumbnail images for each album project. 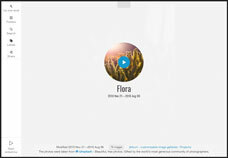 It defaults to presenting the recent projects, which may reside anywhere on your computer but you can alternatively choose to list all album projects found under the "My Albums" folder. 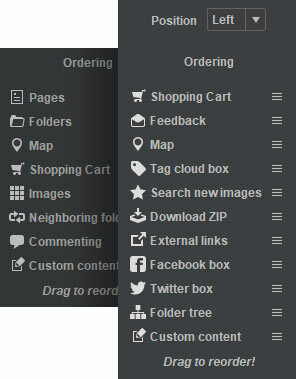 The ordering can also be flipped between recent, alphabetical and reverse alphabetical. To open a project simply double click it or navigate using the cursor keys and hit Enter. Just like Windows Explorer, the Project Gallery has a quick search function whereby it alternates between all projects beginning with the letter you type. 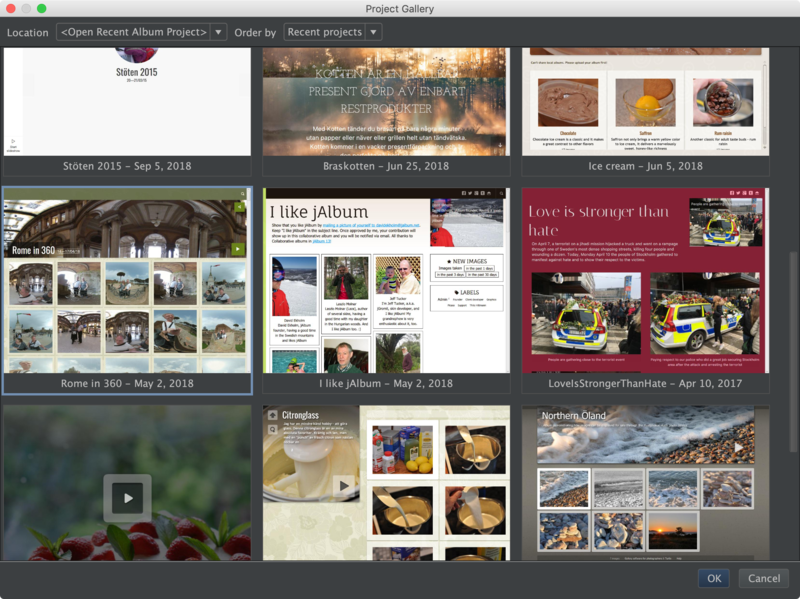 As you open a project, the gallery closes, but you can keep it open and move it next to the main window to quickly browse between projects. 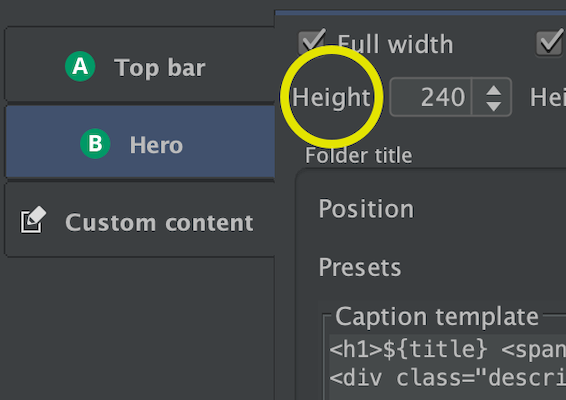 To do so, simply hold down SHIFT or ALT as you open a project. If you right-click an album project it will reveal a contextual menu. It currently has the options "Open", "Preview" and "Reload". Preview opens the project's album in jAlbum's default web browser and "Reload" forces jAlbum to recalculate a snapshot of the web preview. This may be needed if the album wasn't done rendering the initial display when the snapshot was being taken. Present your best images. 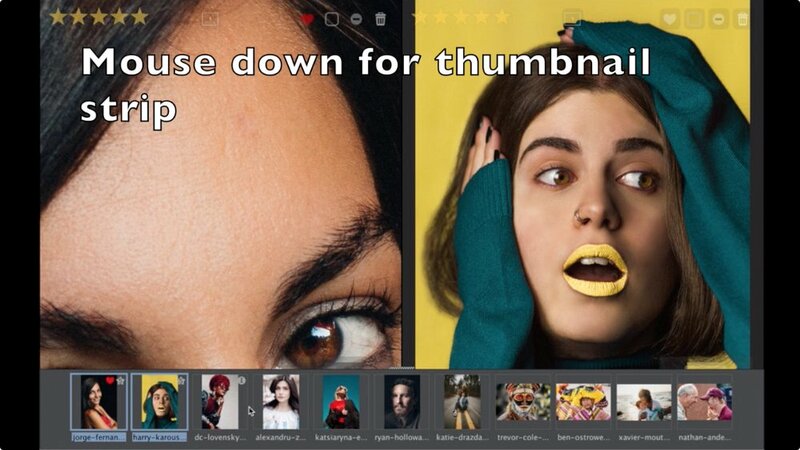 The new review mode of jAlbum 17 helps you to quickly compare images side by side, zoom, tag and rate them. 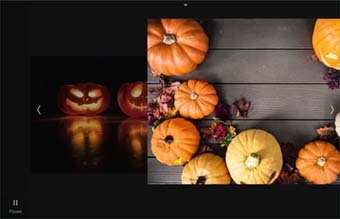 If you move the mouse to the bottom, a thumbnail strip will pop up, allowing you to quickly navigate between your images. 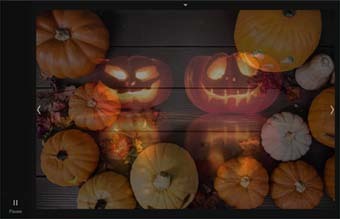 Use CTRL and SHIFT+clicks to select multiple images and ranges. 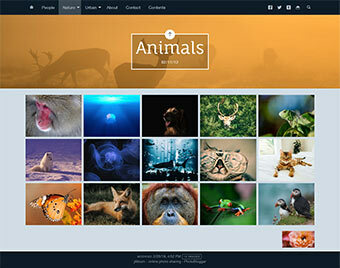 The selected images can now be quickly rated or excluded with a button click. Use keys 0-5 to rate and "-" to toggle exclude/include. You can also use keys 6-9 to apply various flags to your images. 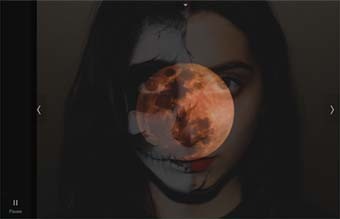 When you move the mouse on top of the closeup images, the hovered image will highlight. Keys 0-9 and "-" will now rate, flag and exclude that highlighted image only. This allows you to quickly work your way through the images. (You can naturally use the mouse too). Simply use the left and right arrow keys to navigate back and forth. 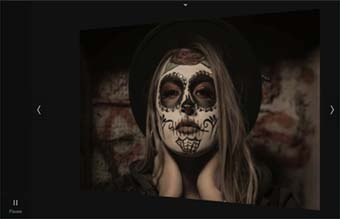 Use SHIFT+left or SHIFT+right to bring up the next or previous image next to the existing one. Hit CTRL+A to select this group. I hope this new review mode will be a real time-saver for you! All available in jAlbum 17! Grab some popcorn, sit back and enjoy our newest skin – Projector. It was made to offer the best slideshow experience. Yet we didn’t forgot about popular features like search, tags or maps like those found in Tiger skin. The layout consists of 3 main sections: the side bar (function buttons), the cover page (folder info, subfolders) and the lightbox (with the thumbnail strip). 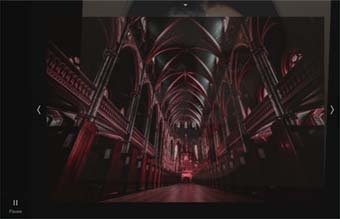 The lightbox shows the slide images in full window, and all the other page elements are designed to be the least distractive. Works fine on mobiles; you can even use swipe gestures too to flip through the album. 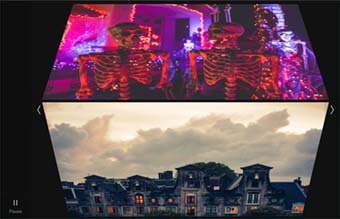 The thumbnail strip can be placed to any corner: left, right, above or below the picture – it’s up to you. During slideshows the thumbnails get hidden. Similarly the captions on the photos can be moved to your liking – even in the middle of the photo. The idea came from our Wordpress plugin, which was made to showcase jAlbum-made albums within blog posts (or any page by the way). In that plugin you are able to choose from a bunch of spectacular transition effects, which made it popular amongst Wordpress users. We thought this can make a great new jAlbum skin. There are 9 transition effects available in Projector, of which three works in 3D, see Settings / Projector / Lightbox / Main image / Transition. Click the pictures below to see them in working! Speaking of the styles, Projector has inherited Tiger’s all 27 styles, so you can easily reproduce the same feel. 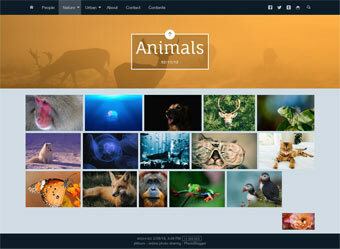 Naturally, you can customize all the colors, fonts, background images and many more aspects, just like in Tiger. You can add your logo, custom links, and custom content to many places. All the custom pages have received a face lift too, to match the new design. 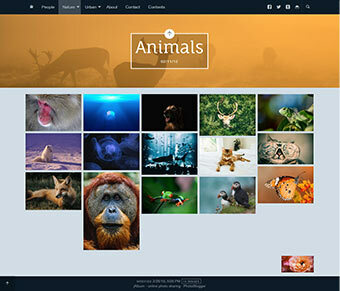 Technically, the skin is based on the so-called “flex layout”, which offers the best flexibility in arranging and aligning the page sections on different devices. Today all modern browsers support this new layout mode. Internet Explorer 10 and below are not (you guessed), but fortunately their market share has already dropped below 1%. (The poor implementation of 3D effects in Internet Explorer 11 results in a flawed viewing experience with 3D transition types: Cube, Book, Flip). 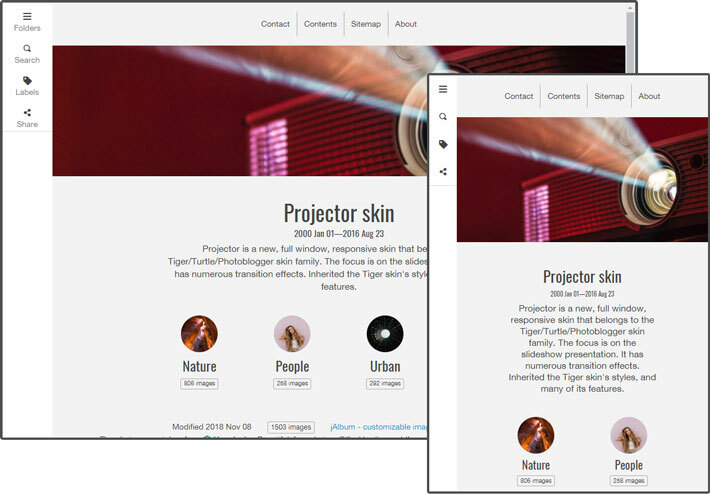 When you select Projector from the skin selector all the matching settings will be imported from Tiger, Turtle or Photoblogger, because they all belong to the same “skin family”. (If you’re on jAlbum 16 or older, the settings will be imported even from the Empty project! Pay attention!) This feature makes transitions from one skin to another easy, but not all settings work equally good with Projector. Notably the thumbnail sizes have to be adjusted to play nice with the new skin. So visit Settings / Images / Image bounds / Thumbnails and set 90x90 or something similarly small, as larger thumbnails take too much space from the images. In the near future, Projector will receive even more of Tiger’s advanced features, like the shopping cart and feedback. Comments are welcome, but please post bug reports in the skin’s forum.